Strange Lands is a deeply researched and richly illustrated information guide to the entities and beasts of Celtic myth & legend and to the many strange beings that have entered the lore of the land through the influence of other cultures and technological evolution.At nearly 400 pages and featuring over 170 original illustrations, Strange Lands is an essential accompaniment for both the novice and seasoned walkers between worlds. Containing over 100 original pen & ink portraits alongside biographic text, The Human Chimaera is an indispensable guide to the greatest stars of the circus sideshows and dime museums. Includes a foreword by John Robinson of Sideshow World. Imagery drawn by Andrew L. Paciorek from the mind of Andreea V. Balcan. 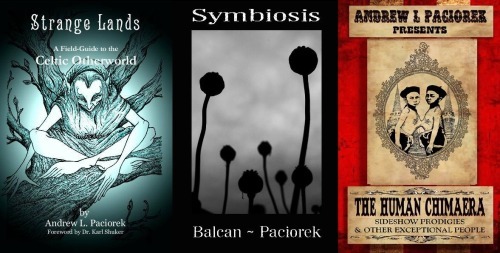 80 pages illustrated throughout, Symbiosis brings together the Balcan~Paciorek experimental projects exploring language, emotions and alchemy – ‘Pandemonium Vaudeville’, ‘The Anomalous Lexicon’ and ‘Conjunctio Oppositorum’. Available in a choice of 3 cover formats and also as an e-book for iPad / iPhone. In addition to the books mentioned above, Andy has also produced work for other books including some of Harper Collin’s Element Encyclopedia & Art For mindfulness titles and the charity book project Cumbrian Cthulhu.